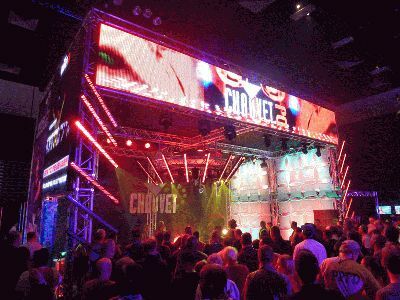 CHAUVET® DJ, a leading manufacturer of LED lighting, announces the launch of 10 new products and the sponsorship of major event components during the 2013 DJ Expo taking place August 12 – 15 at the Trump Taj Mahal in Atlantic City. The 2013 DJ Expo, presented by DJ Times, hosts over 25 educational seminars and features top audio, lighting, studio and specialty product manufacturers who offer the latest in cutting-edge technology. This year, CHAUVET DJ and TRUSST® take the spotlight at one of the most exciting DJ trade shows in the United States. The TRUSST-built, 30-by-40 foot CHAUVET DJ booth (#712) is set to feature vital lighting equipment for your mobile rig in live application settings. A section of the booth will also highlight specific pieces in the TRUSST trussing system including totems, corner blocks, base plates and connectors. Be on the lookout for gear guaranteed to leave you a step ahead of your competition, as well as new fixtures joining some of our most popular series. For the third year in a row, CHAUVET DJ hosts one of the show’s most anticipated events—the Promo Only party. In previous years, Sean Paul, 50 Cent, Lady Gaga, Lil’ John, Naughty by Nature, Cyndi Lauper, Pete Wentz and Jason Derulo have taken to the stage for surprise performances, and attendees can expect a star-studded lineup again this year. CHAUVET DJ is sponsoring the show’s main stage and a seminar, while TRUSST is sponsoring an additional seminar. The DJ Times Square Stage, where talented artists in the industry perform, features an enormous stage complete with a TRUSST truss setup illuminated with in-demand CHAUVET DJ gear. As seminar sponsors, CHAUVET DJ and TRUSST are scheduled to deliver two seminars filled with tips to maximize your profits as a mobile entertainer. On Wednesday, August 14, Geoff Short demonstrates and discusses versatility of TRUSST setups at 9:30 a.m., while Jeremy Brech provides tips on upselling clients and earning the most profit at any gig at 10:30 a.m. — both seminars take place in Diamond Room B.